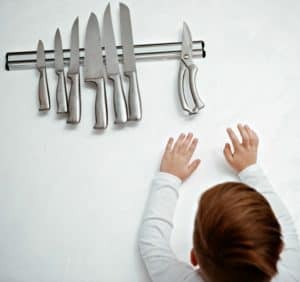 Small child reaches for sharp kitchen knife that has been left in his reach — not safe! Promote both your safety and your convenience in your kitchen. Set up your work areas to accommodate your height and your reach. This should be done only if, of course, you are the main cook! Always before now, I have been the main cook, producing a full meal most evenings. Usually, I was able to produce enough so that we could all have leftovers for lunch the next day, too. How easily this happened depended on my kitchen work area setup. When I divorced in 2012, I slowly began to relinquish the kitchen duties to my younger daughter. She’s a good cook and stands around five feet seven inches tall. I, on the other hand, stand a teeny touch less than five feet four inches tall. Things have changed in the kitchen, let me tell you! I can no longer find anything in “my” kitchen. When I do find it, I can’t reach it. My daughters find this hilarious, including the older one who is “five feet two with eyes of blue” (assuming she’s wearing the right color of blouse). I, on the other hand, grumble and complain, then sit back and wait for food to arrive with little or no effort on my part. It took a while to reach this state of bliss, though. And I learned a few things about choosing a home and prioritizing the kitchen each house had to offer. So, let me tell you about some of the kitchens I’ve lived with and what I’ve learned about designing for safety and convenience from each one. The first kitchen I remember clearly was in my childhood home. It was a tiny little house that was built not long after World War II. It had been “remodeled” in some odd ways — the front half of the garage was used to extend the living room to something akin in shape to a semi-trailer in the front of the house. In the back, the rear of the garage became a laundry room, with the back door in it. Besides the laundry machines, we also used it for a small third bedroom. The kitchen, however, was basically repainted and left alone. From a tiny dining room, you walked into a room about 8′ x 8′. On the left were two wall cabinets next to a window and a base cabinet next to the sink cabinet under the window. The sink was one large basin, which I did not like. I prefer a double-basin sink. Straight ahead was another wall cabinet over another base cabinet. To the right of that cabinet was a large old-fashioned four-burner stove (gas-powered, because this was in Texas, y’all!). The large flat center area of the stovetop was the perfect holding\warming area for pans full of food after they were finished cooking but before serving. To the right of the stove was about a foot of clear space which, turning the corner, continued about three feet along the wall to your right. Then there was the small refrigerator, standing sullenly in dingy loneliness. Taking things out of the refrigerator, to reach the one thing you really wanted, could take some time and balancing of various dishes. It was a disaster waiting to happen. On the plus side, the kitchen was small enough that one stride brought you into easy reach of all necessities: dishes, silverware, pots and pans, running water, cooking area, and refrigerator. Only one person could really work in there at any given time. On the other hand, I also remember peeling many a potato while seated at the dinette set in the dining room, so it wasn’t totally hopeless. Looking out the window at the large, beautiful backyard (beautiful because this was north central Texas, y’all!) was a real lift when washing large numbers of dirty dishes. Also, the gas stove made cooking without mishaps much easier than an electric stove ever could. Changes of temperature were basically instant, unlike on an electric stove. Another kitchen that I used a lot was the one in a house I rented in the Austin area. It was an old farm house and had it’s own share of peculiarities. I loved it though. The area was heavily wooded and just gorgeous. The kitchen was much larger. I’m guessing it was about 20′ x 20′. On the north wall, an old gas stove filled a corner. It was followed by a sparse line of wall and base cabinets about eight feet long. Above the sink was a window to the backyard and beyond, where I often watched cows and deer grazing together. To the right of the last cabinet was the back door. On the east wall dead-center stood a refrigerator in lonely splendor. The south wall held a small table and two chairs, which I almost never used for dining. The west wall sported one window and an electric clock that often told me I was late leaving for work. This kitchen would have been hard for an older or disabled person to work in. The walking needed to prepare a meal would be painful and tiring. Widely scattered work spaces made for much walking for each meal. It was so big, with so little storage. There was also little work space. I eventually brought in another small table just for a preparation surface. It sat by the refrigerator, making it possible to fill the refrigerator without balancing so many items. I loved this kitchen (my first unshared-with-anyone-else home!) but it was not good for safety or convenience. For safety reasons, as well as for the ease of corralling the occasional cooking odor, I like a separate room for my kitchen. I think the “open, light, airy” one-huge-room living area must have been created to save builders money, not for safe and convenient living. Windows, especially over the sink, where I often spend my time cleaning dishes and such make me happy. I really prefer a two-basin sink. A place to sit down and make grocery lists and menus and such is always a welcome addition. Counter space beside the refrigerator makes it more convenient and safer to take out ingredients or to put in groceries without dropping or spilling things. I much prefer a gas stove over the electric version. Instant-start burners also cool down more quickly, making burns less likely. It’s also easier to control cooking temperatures for better prepared foods. I enjoy having enough space to work with one of my daughters, but not so much that I have to do a forced march to retrieve all the ingredients needed for a dish. Three steps should bring you very close to covering the space between one work spot and the next, such as from cold storage to the mixing center. 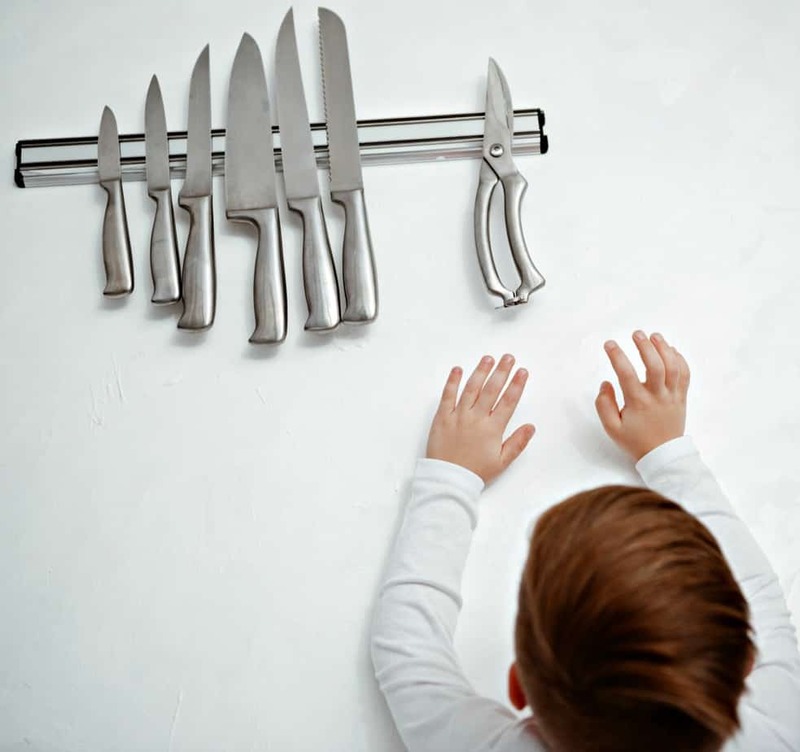 Promote both safety (no running into each other holding sharp knives) and convenience in your kitchen by designating certain areas to be used for certain tasks. Mine usually have several such areas, but the main ones I use are the mixing center, the wet center (anything using lots of water), and the ingredient prepping/cooking center (chopping, slicing, sauteing, cooking). The easiest and most convenient path between these is a triangle. This lessens the need for moving past each other with utensils or pans, etc., in hand. So, setting up your work areas in your kitchen can enhance your safety and your convenience. Looking for the right features when you move homes can make your life a lot easier, especially if you hope to save money by spending a little time in the kitchen!